When you see the words, 'Movies' and 'Betsoft Gaming' in the same sentence, you know you're pretty much for in a wild ride. 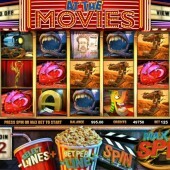 The 3D slots developer Betsoft Gaming has been a byword for slick, intuitive slots over the years, and they've hit the target once again with At The Movies. However, rather than any full-on movie cut-scenes a la As Night Falls, this is a very simple slot dedicated to movie-going and the cinema. Therefore, in this 5-reel, 25-payline slot we get a backdrop of a classic cinema (there's not a multiplex in sight), complete with velvet curtains, cups of fizzy drink and buckets of popcorn. Betting starts at just $0.02, and there's a $5k jackpot up for grabs, although no progressive. As I said, the game is all about the celebration of cinema and nostalgia. Everywhere there are references to classic icons of the movies: awards statuettes, popcorn, a Hollywood magazine showing Brad Pitt, a set of vampire teeth, a heart-shaped cushion to symbolize a romance, movie projectors and film tickets. The familiar 10-through-Ace symbols are included too, but have been altered to fit in with the movie theme (the sci-fi robot Jack symbol is a particular favorite, jetting off into outer space when it forms a winning combo). The dramatic Comedy/Tragedy masks symbol acts as the Wild and substitutes for everything other than the scatter. It doubles every win. The camera is the scatter and awards free spins whenever forming a winning combo. Five cameras awards the top payout of 20 free spins. That's about it for your bonuses in At The Movies: no explosions, no expensive-looking cutaway scenes or 5-level bonus game rounds. 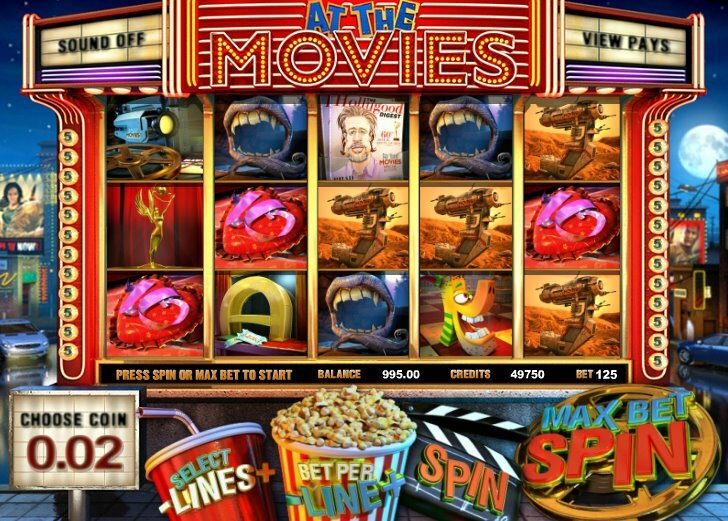 At The Movies is a slot for those who like their games well-made but simple. Get rid of the fluffy bonus games and give me free spins! Saying that, there aren't really that many free spins to be had, and for my money if I'm keeping things simple I'd rather take on something like Betsoft's new release, the fireworks-themed Boomanji. However, film fans will love this, and if it takes your fancy, make sure you check out Sheriff Gaming's film-themed game, Billion Dollar Movie.